Trading binary options entails a lot of factors to consider: what strategy to use, what expiry times to follow, how much is a trader willing to invest, and how much risk is the trader willing to take. All these factors, plus more, play an important role in every trade entered by the binary options trader. Knowing how each of these factors affect the trade will definitely help the trader to formulate better strategies that will provide a greater yield. As the binary options trader masters the way these factors play in the trade, he will soon find consistencies that make trading even easier for him. The type of asset is another important factor that the binary options trader must consider. It is important to choose the right asset, so that the trader can focus on a specific sentiment, rather than having to trouble himself with all that is going on with all the assets. New traders are guilty of this. Sometimes, they get overwhelmed with the number of assets and charts that they are constantly monitoring every trading day. It then becomes necessary to choose only a single asset to trade in to begin with. A specialization in a given domain allows the trader to master the entire factor in its fullest. While on the contrary, multiply assets will require the new trader to know about each individual assets which could easily lead to confusion. Forex, or the foreign exchange market (also called FX or currency market) is a worldwide decentralized market for trading of currencies of different countries. Larger international banks of the G countries are the major participants of this market. Financial centers around the world trade the monies of the countries around the clock, with the exception of weekends. The foreign exchange market determines the relative values of different currencies. Forex is just one of the four assets that can be traded by binary options traders; the other three being stocks, indices, and commodities. Because binary options allow a trader to take full advantage of the performance of the financial markets and to profit from it, and Forex is a popular trading asset, most new traders go for Forex in trading. Whether the trend is bullish, bearish, or any other trend type, as long the right strategies are implemented, maximum profit can be achieved for successful trades. Because Forex is popular, there is greater volume in this kind of asset. This means that this asset is more liquid to smoothen the trades and is not affected by sudden news that could change the market. Unless U.S. declares war on Britain or vice versa, which would have a probability that is very close to zero, the values of Forex does not easily spike from a low value to a high value in short periods of time. Forex binary options traders also benefit from its popularity in the sense that price action indicators can easily be read because of the “going with the flow” effect. This type of trade is a pair, which means a ratio between currencies, rather than a relative price value on the market. In very short time, even as quick as 60 seconds, a binary options trader can earn from the price movement of Forex trading. We have a list of incredible binary options brokers where you can reap the benefits of fast and reliable trading. Profitable positions can be practiced over time when you are aware of the investment you make and even manipulate your risk and breakeven factors. Strategies based on technical analysis will help the binary options trader understand how easy and intuitive it is to trade Forex binary options. Forex pairs are the ratios of the relative values of a currency unit over another currency unit in the foreign exchange market. The currency that is used as the reference is called the quote currency and the currency that is quoted is called the base currency or transaction currency. The most traded currency pairs in the world are called the Majors. They involve the currencies euro, US dollar, Japanese yen, pound sterling, Australian dollar, Canadian dollar, and the Swiss franc. The next logical questions would Forex pairs would be the best to trade? The most popular Forex pairs are of course, the Majors. This is because these pairs come from big countries with a good and stable economy. They house some of the biggest industrial players in the market. They also have abundant natural resources that also affect the values of the Forex. History also plays a part in the world market. It should be worth noting that these pairs are not “standard” so to speak. 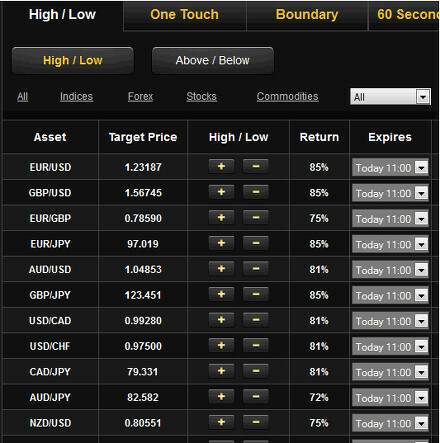 But these pairs are the most highly traded pairs in Forex and binary options. Another advantage of trading Forex binary options is that although trading currency pairs through binary options involves risk, it is still considerably lower that trading in the Forex marketplace. Binary options trading with Forex allows a trader to know upfront how much capital he might lose or profit on each trade. A binary options trader also knows how much he stands to profit. With conventional Forex trading, neither is known. Many Forex traders have held their positions in losing trades, hoping for a turnaround, only to see their entire capital base erode. This does not happen when trading Forex binary options because the binary options trader is able to control his trades. Lastly, many who trade in the Forex market use leverage to increase the potential profit they can make on a given trade. The downside to using leverage is that it also increases the potential to lose. This scenario is infeasible with binary options trading. Look into our list of binary options brokers to compare currency pairs then sign up to start trading. We will continue to help you profit from trading binary options.